Smt. Beenaben Pandya, wife of Shri Shreyas Pandya was such a pleasant, good conduct, loving, openhanded and valiant personality. She has done a lot for her family, friends and society. She lived her life lively and she never gave up. She herself was an inspiration academy. Whatever she has done in life is admirable. On June 9, 1956 a desolate incident happened on the globe, a beautiful baby girl born at Late Smt. Leelaben and Late Shri Jamnashankar Pandya’s place. That Capricorn signed girl was named “Beena”. She started her education from Vidhyanagar School & graduated in psychology from St. Xavier’s College. She got married on 7th May, 1974, with Shri Shreyasbhai Pandya, son of Shri Vishnuprasad Pandya, who owned Gujarat’s famous printing house “Sahitya Mudranalaya”. As a fruit of Beenaben and Shreyasbhai’s happy marriage life their woodland bloomed with a flower. 2nd April, 1977 became a memorable day as a baby girl named Meghna born at their place. A new job commenced for Beenaben as mother. Beenaben’s heart got wet with emotions. 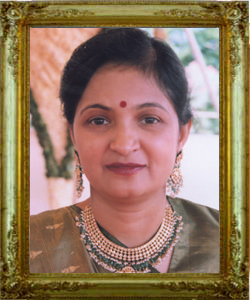 Beena played as a vital bridge among her in-laws. Beenaben heartily attended her paralyzed father in law for long nine months. She believed that, “To serve is not my duty, it’s my right”. Beenaben always woke up in auspicious time at 4:30 in the morning. She had set a routine of prayer, meditation and walking for continuous three hours. Husband and daughter both were the centre of her life. It is an incidence of greatness of life to give a daughter in marriage. In the year 1999, they got her daughter married with Shri Udit Divetia. By God grace Beenaben & Shreyasbhai got chance to entertain their son in-law, Aarsh in the year 2003. In the year of 2005 Beenaben again got chance to entertain her daughter in-law named Isha. Beenaben was now over the moon. It is said that: “Good human being doesn’t be in this world for long! Those who necessitate on planet, necessitate on heaven too.” Beenaben enjoyed delightful marriage life for 34 years. But after that, curse of cancer entered in their life. Beenaben was the victim. Though diagnosis of cancer had done, but she never gave up. Her self confidence itself acted as transmission of force for life. Beenaben was indeed a fearless soul. Beenaben fought against cancer with hope to win over death. Operations had done. Symptoms of weakness covered her body. Although she was full of desire to go across the world. That’s why she showed courage to travel across Switzerland and U.K. In addition she went to holy river Ganga in Hrishikesh. Beenaben and Shreyasbhai used to go to Tirupati temple every year. Before death in September 2008, weaknesses covered her. Death was gradually chasing her. She now lost the preserved confidence that she would defeat the death by March-2008. Despondency now started to secure her pleasure and joy of life. But Beenaben did not want to say good bye without paying the last debt by visit Tirupati. Shreyasbhai was ready with weeping eyes to fulfill all her wish. In September 2008, Beenaben finally had been to Tirupati to say ‘Good Bye’ to lord Balaji. That was her last convention with Lord of Tirupati. She was not even able to move around for past six months. Her soul dislikes being on bed. Countdown started for journey to heaven. She loved her home in a way that, even after taking chemo therapy for fourteen times, she preferred to come back home at night. But now she required harmony of medicine and supplication. Problems like shortness of breath and weakness had been started, but still she had hold on memory. Otherwise she would not be able to recognize the child specialist who healed her in childhood. She was not able to speak but wrote doctor’s name on a piece of paper. She spent her last fourteen days of life in Sal Hospital, last seven days of those she spent in unconsciousness. It is said that, the memory becomes sharpen when one is next to death. All the incidences of past life pass across the eyes like a movie strip. Soul can visualize everything by inner eyes. In those last moments of life, Beenaben perhaps felt pain as she could not blessed her loving daughter Meghna for last time. Beenaben left all for endless journey on 14th December, 2008. Today Beenaben is not among us! But she is living in our hearts as a ‘legend’. May God give peace to her holy soul!